In a world where reboots and remakes are popping up like weeds, it’s nice to go to an alternative that tries its best to be something original. 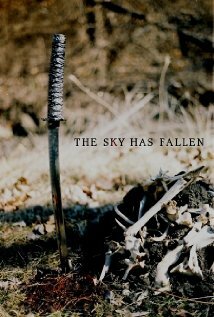 In this case, I’m talking about the 2009 horror The Sky Has Fallen. Its been a while since I watched something with a post-apocalyptic aspect (no, I haven’t seen the latest Mad Max yet, I’ll get around to it in time), and the director Doug Roos was kind enough to hook me up with a look at his endeavor, so thanks go out to him. The majority of the world’s population was decimated by an unknown disease that appeared out of nowhere. Those that survive begin to see strange figures all in black taking the bodies of the dead in order to do some bizarre experiments on them, ultimately turning the dead into an army under their control. 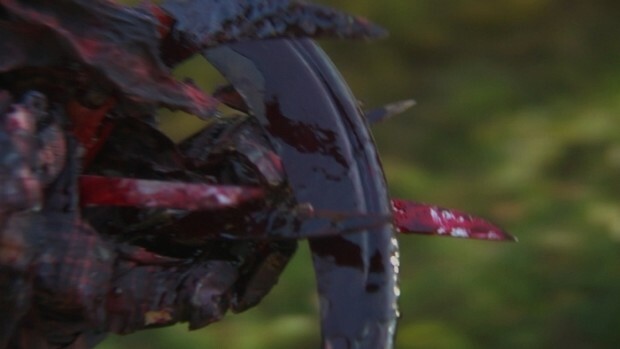 The walking corpses are hideously scarred and deformed, and many of them have makeshift weapons like blades attached to their hands. Their only apparent purpose is to kill those who still live. Which brings us to our two main protagonists, Lance and Rachel (Carey MacLaren and Laurel Kemper, respectively). They have been surviving for months before finding each other in the woods. Lance is hellbent on finding the leader of the mysterious dark figures and killing it, mowing down mobs of the undead with Rachel at his side, and trying not to succumb to the dark ones’ ability to attack the heroes with their weird mental powers. Whoever these mysterious dark ones are, they’re either fans of Nightmare on Elm St., or Edward Scissorhands; I’m not sure which. The Sky Has Fallen is a breath of fresh air in some ways, but not so much in others. Director Doug Roos was completely dedicated in bringing a gore-filled extravaganza with nothing but pure, unadulterated practical effects. And boy, do we get it in spades. This flick is proof positive that not only can you still make a horror movie without CGI blood and gore flying around, you don’t need to have a high budget to make it happen. The budget for this movie was miniscule, and the makeup and gore was more convincing than many of today’s horror flicks that have millions of dollars behind it. It’s no wonder that Roos has listed Aliens and John Carpenter’s The Thing as part of his influences. Unfortunately, as with 99% of movies out there, it wasn’t without a couple of issues. The biggest one for me was the acting. I’m sure that Carey MacLaren and Laurel Kemper are awesome people and all, but they really didn’t do much for the movie’s energy. And given that the are in the majority of the running time, that’s not a good thing. The two actors look and sound disinterested and bored with what’s happening throughout. They do have their moments, but they’re very few and far between. For example, a certain scene which found the heroes having a shotgun pointed at them by a random stranger resulted in their looking just as unimpressed as if said stranger was pointing a stick at them. And when the situation was resolved and the three started talking friendly, they still couldn’t have been any less energetic unless they were the zombies they were trying to avoid. Get used to the looks on these faces; they almost never change. Hell, even in a scene where the Lance wakes up startled from a nightmare and damn near cuts Rachel’s head off, she doesn’t react in any way. It made me wonder if the actual plague in the movie was an epidemic of boredom and indifference. The most energy you’ll see is from the random extras getting killed by the undead army, screaming bloody murder. Or when Lance attacks something and lets out a scream so uncharacteristic of him it’s just jarring. The second (minor) issue is that there is an excess of close-up shots. However, from what I read, that was apparently intentional as the wide shots weren’t looking the way Doug Roos wanted them to look. So this wasn’t as big a thing to me. Again, given the budget restrictions, sometimes you have to work around some things as best you can. And that’s what needs to be remembered here. In a world where skin care products are just a memory..
Issues aside, this was still a solid effort helmed by a guy who clearly has a deep love of horror, and who put together a practical effects fest in what was his debut full-length feature debut. If Roos was given the millions that I previously mentioned backed up so many horror movies over the years, the potential would be very high indeed. Then again, chances are he would probably be pressured by some studio execs to change this or that, and screw up everything. But who knows. Anyway, despite my gripes with the acting, you should still watch The Sky Has Fallen, if for no other reason than confirmation that you don’t need CGI and shaky cam to make some impressive effects happen. It’s won awards for Best Feature at the 2009 Freakshow Horror Film Festival, and Best Horror Feature at the 2009 Indie Gathering Intl Film Festival, so that should tell you something. Until next time, rest in peace. Macabre Rating: 2.5 out of 5 tombstones. This entry was posted in Macabre Reviews and tagged Doug Roos, Macabre Review, Review, The Sky Has Fallen. Bookmark the permalink.